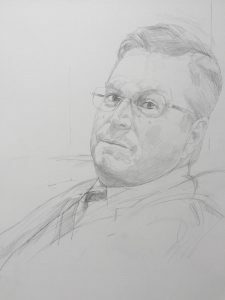 As a charity dedicated to portraiture, we embrace the trend in international patronage and provide a portrait consultancy service to make the commissioning process easy and enjoyable. When it come to getting the best in portraiture, distance is no longer a barrier and the low pound is positively enticing. Many of the portraits commissioned from around the world are created from live sittings. These take place either here in the U.K. or the artist can fly out to the sitter. When the sitter is unable to travel portraits are created from photographs which are sometimes combined with Skype calls. Having browsed the Online Artist-finder he chose the artist Alastair Adams. He met the artist at a time when he happened to be visiting London. Together they came up with the concept of creating a portrait of his father, who is still alive, which would contain the photograph of his mother as a way of remembering the two of them together. 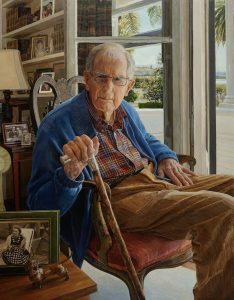 Alastair flew to California three times for sittings and completed the portrait over a six month period. Delighted with his experience, the commissioner wanted a second more intimate portrait of his mother for a different location. This time he worked with the Commissions Consultant. The consultant created a portfolio of appropriate artists who could paint a portrait using only existing photographs. He chose Toby Wiggins. Toby created a small painterly oil painting. This tiny work of art was shipped out to his father’s house where it still hangs. 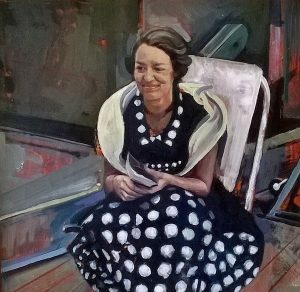 (You can see the original photograph which was the inspiration for Toby Wiggins’ portrait in the foreground of Alastair Adams’ painting). American institutions also frequently commission British Artists. 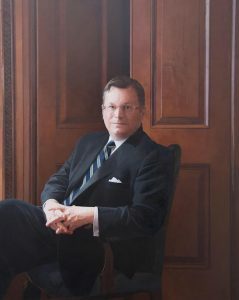 The Union Club in New York, for example, took a lot of trouble to survey both American and British artists before selecting Royal Society of Portrait Painters Member, Paul Brason for the portrait of Eric Widing, Deputy Chairman of Christie’s New York. In this case sittings took place in both the artist’s studio and in New York at the Union Club. There was a time when the American portrait-painter crossed the ocean to enjoy the favourable climate for patronage, John Singer Sargent and James McNeill Whistler being eminent examples, but now it is the patron from the U.S. who is commissioning the British-based Artist.